With over 450 reviews tallied on Steam, Serious Sam VR is holding with a very positive rating for this intense and gruesome wave shooter. We previously covered the blast from the past when it was nearing launch into Steams early access and now its getting a massive new update that may attract new users and inspire previous owners to pick up the controllers again. 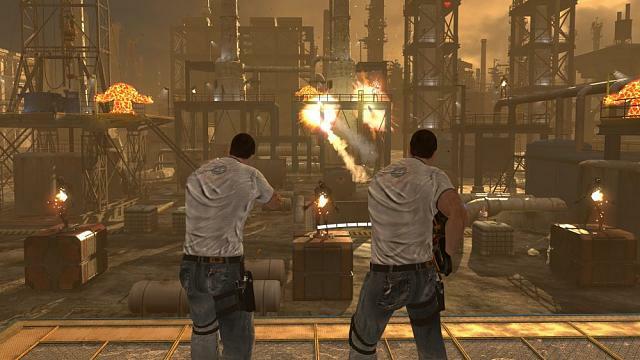 In fact, you no longer have to go alone as Serious Sam VR is adding a co-op mode that works for any of the current levels. Serious Sam VR is currently still in early access and goes for $39.99, but is offering a solid amount of visually appealing and polished content. In the game, you control Sam as you attempt to save the galaxy from an onslaught of small and absolutely massive monsters. This new update is bringing even more value to the title by letting you team up with a friend as you fight from the BC Saratoga ship. You can co-op with two HTC Vive units, two Oculus Rifts, or a combination of the two. There are also new weapons and a couple new difficulty modes to experience: Tourist, which we can assume lowers the difficulty a great deal, and Serious which likely takes it up to the next level. Both new difficulties are available in single and multiplayer. Early access is a useful space to iron out issues brought to developers via the community, introduce new features until the full scope of the game is apparent, or even to gauge interest in the games current status. Serious Sam VR was already doing well in its current form but new additions of this caliber along with gameplay balancing and enhancement will bode well for the game once it releases in its full form. Check the game out on Steam. Hopefully more of these single player experiences will start and get multiplayer or co op modes. For instance, Space Pirate Trainer could be an interesting on to add co op to.